Hi ya! I hope you all are enjoying the cheap candy sales. Here's a belated Valentine for you all. A sort of conversion of the Celebration "Flower Girl" dress for AF, TF, and EF. I believe in fashion design terms you would call this a ballerina length ballgown silhouette with a sabrina neckline. The top and textures are from Amaryll's Art Nouveau dress and the shoes are Sentate's t-straps (I love those shoes. They remind me of character shoes from my drama club days. :D) Fat morphs for all and a pregnant morph for AF. 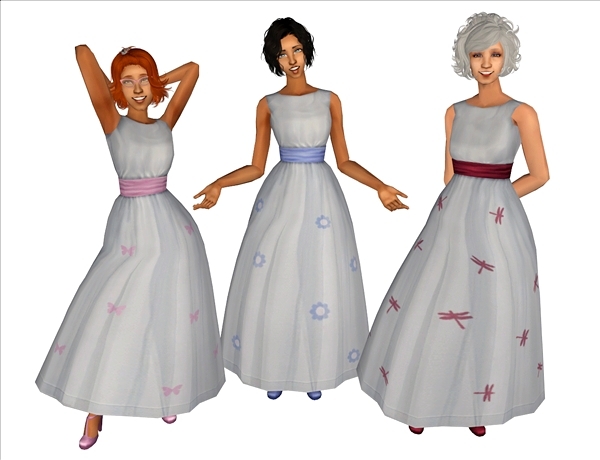 Comes in the original Celebration pastels and patterns, plus a red dragonfly recolor (I also included a matching red recolor of the original CF dress) and all textures are slaved to the adult dresses. This is a big skirt so expect "pocket hands" when their arms are down. They turned out lovely Skell. Thanks for sharing them. Late comment. These are very pretty with classic lines. I think they would be perfect for the bride too. Thank you for sharing.